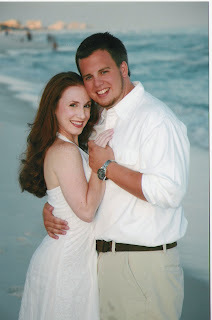 Here is one of our engagement pictures. This one is not my favorite but it definitely shines from the others. I just realized how insane I have been the past couple of weeks just by looking at my previous (the one about my sister was for my nephew who insisted I write a joke for my sister/his mother). Of course my wedding date is not April 5, 2007. Stupid typing (and lack of sanity). The wedding date is proposed to be April 5, 2008. After coming home from vacation we just decided there was no reason (except for having a pretty cool wedding date like 8-8-08) to wait over a year to get married. But that hasn't been officially decided yet. No one warned me how incredibly stressful planning something as important as a wedding can be. The main decisions have been made but you get all these details that are thrown at you like big snowballs. The wedding party hasn't been officially asked but we have an idea and there are still some things we have to work out in order for our wedding party to be official. With the expected size of the wedding, you can't really be lazy with details or it will all fall apart...but in the end...years from now we won't be worrying about it at all. It really is such an exciting thing. I am excited about our relationship in particular. The wedding aspect is wonderful but Andy and I have really grown as a couple the past couple of months (even before the engagement). I can honestly tell you that I could not have asked for a more perfect match than with him. I'm kinda tearing up just thinking about it. He balances me spiritually, mentally, and of course emotionally. We have decided to do the premarital counseling with the church starting after Christmas. I personally wanted to do this because our foundation is in the church and find it important to really concentrate on the marriage and to really dig deep with our faith.